I’m out of the office today on the road. Might be gone until too late to do any writing tomorrow so I will leave you in Mark Armitage’s hands on the objective evidence Mark predicted just a few short years ago would turn out to be the norm. Mark was correct! Mary Schweitzer discovered soft tissue [can’t be millions of years old] in Tyrannosaur Tibia in Montana. Mark then traveled to Montana and discovered a 40 inch Triceratops horn, finding soft pliable tissue and blood vessels/blood cells etc. As you can see in the video, Mark Armitage is happy his prediction that soft tissue is the normal case has been confirmed in a published data and paper involving 15 positive soft tissue finds in 16 samples. The prediction is coming true and this evidence opens the way for the light of God’s evidence refuting the dogmatic stance subjectively claimed. The dogmatic, lost in the Dawkins Delusion and errors of Dr. Ehrman and Charles Darwin, having to rethink actual history due to the evidence is an entertainment for this writer. Lord Bless. Jesus is the Way, The Truth And The Life. Chris Queen. 2/15.2019. Please hit the Follow Key above and to the right for future updates. Investigate this renewed field of Young Earth Creationist Paleontology by contacting Mark Armitage at micromark@juno.com. Please leave me your valued comments in the form below. 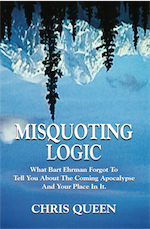 Get my books Misquoting Logic HERE and Misquoting Calculus HERE statistically showing Dr. Bart D. Ehrman’s claims as error. Dinosaurs in art from everywhere around the world thousands of years old. HOW? Unless they saw them for themselves as the pictures suggest.